Day three of Snowmageddon and it turns out that becoming a hermit in my warm flat means a massively increased appetite. Having spent the last two weeks eating small portions and snacking on fruit and unsalted nuts (the inferior kind if you ask me) my body has finally cottoned on to my new ways and seeing the snow and ice has gone into full on panic mode. Snow = winter = fat needed to keep warm. No matter how many times I’ve told my body that I have layers, scarves, gloves and a coat (lies, I have no gloves but what it doesn’t know doesn’t hurt) and excess body fat is no longer needed in the battle against the cold, I find myself reaching for the foods that are good for the soul but most definitely not the waistline. Stupid body and its greed that evolution can’t seem to phase out despite the invention of long johns, Ugg boots and hot water bottles. Should probably stop talking about my body like its a separate entity too, before everyone thinks I’ve developed schizophrenia or multiple personalities. This prehistoric greed is what led me to a distinctly American approach to food and that is why have one lunch when you can have two? If you’ve been to the fast food chain Panera in the States you’ll know what I’m talking about as they offer the ‘Soup & Sandwich’ deal, and very good they are too. Maybe in England a tin of Heinz tomato soup and a cheese sandwich isn’t that outrageous, being quite modest in size, but in America just the soup would suffice for a hearty, filling lunch. Justifying my decision to go down this path by reasoning that I wasn’t having a big Sunday lunch like most people in Britain would be today, I set about my gluttonous task. From this months edition of Delicious magazine (Feb 2013) I made leek and potato soup and from French Brasserie by Daniel Galmiche I made the classic Croque Monsieur which you can find anywhere in Paris and is most delicious. I was hesitant about returning to Daniels book after a pretty disastrous and watery attempt at French onion soup which was completely tasteless but this time around the boy done good. The slices of bread are soaked in whisked egg and milk and then fried in butter (music to my ears), eventually becoming topped with cheese and ham and sandwiched together with more bread until the cheese is just beginning to melt. You don’t really need a recipe, but its reassuring to follow the lead of a Frenchman who knows what he’s talking about. Heston Blumenthal rates him on the cover quote, so if its good enough for Heston then it’s good enough for me. You’ll be unsurprised to hear the sandwich was freaking delicious. 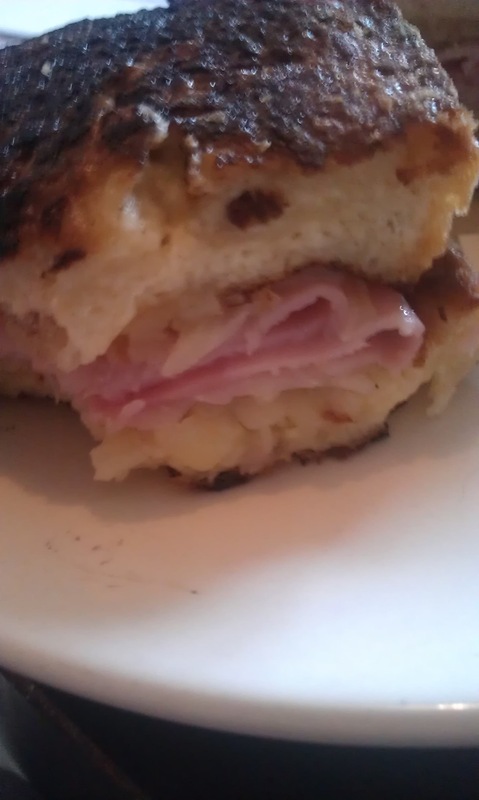 The bread was moist and eggy with a crunch on the outside (I did slightly burn it, my timing was a little off) and the Comte cheese melting with a nutty taste that complemented the salty ham. 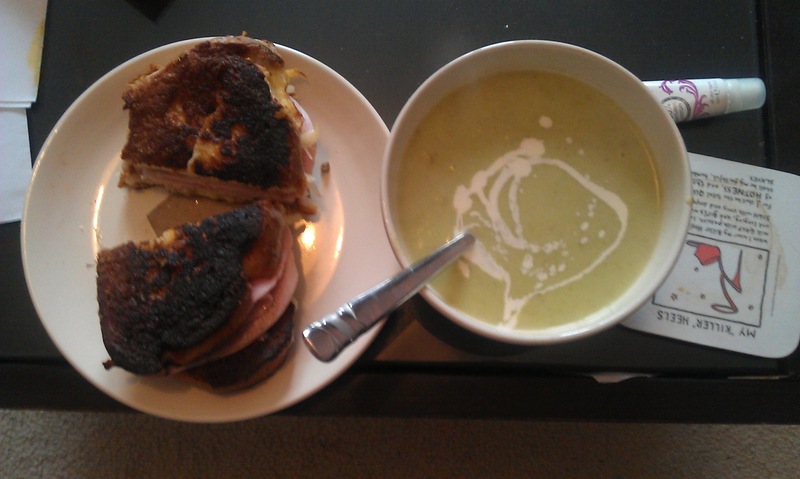 All in all, it was a banging cheese and ham toastie with a touch of French decadence thrown in. Dunked in the soup, it was even better. Soup just seemed like the right thing to cook on a day like today, and having picked up the new edition of Delicious earlier in the week I decided to put it to work. I’m a big fan of Delicious, it has a great mix of easy weekday meals but also throws in some fancy dishes for special occasions, and a lot of my standby dinners hail from my archive of these magazines. I don’t buy one every month but every now and then it catches my eye on the shelf and I have to have it. Other food magazines don’t elicit the same reaction, they aren’t quite as adventurous or interesting, or look as elegant. Favourites from previous editions include a gorgeous Morrocan lamb stew, a spicy sausage pasta, a beautiful rum and banana soufflé (still the proudest I’ve ever been in the kitchen) and a rich Baileys rocky road. It’s cheaper than a cookbook every month too. The leek and potato soup doesn’t particularly live up to these delights but was tasty, thick and rich and went perfectly with the Croque Monsieur. The recipe states that this makes enough for two, but you’d have to be a very generous host for that to be correct, this will provide me with lunch for at least two, maybe three days. Again, it was very simple to put together and had me getting my blender out, which I love. It wasn’t a patch on last weeks sweet potato and squash soup, but when the cold needs to be kept at bay any soup will do. Suffice to say after today’s extravagance it will be back to small portions and healthy snacks, nowhere near as fun but its got to be done. After all, you earn yourself a few treats by being good in the first place. Snow can be a pain for some, but for me, being able to hunker down at home in snuggly clothes with the heating turned up, a cookbook in hand and nowhere to go is sheer perfection. Admittedly, it’s not entirely perfect what with The Boyfriend not being back for a few days, but I’m adaptable and having free rein over the TV all night is the silver lining I’m clinging to. I’m very thankful too that I have a ridiculously well stocked store cupboard, meaning a quick walk round the corner to the local shop to get fresh food was all I needed to cook up the perfect snow day meal. I did nearly fall over approximately 20 times in front of the much more agile children sledding down the slopes while on my travels, but no matter as I had chocolate in my shopping bag! Green and Blacks chocolate to be precise, the good stuff, the ‘you know it’s payday’ stuff. But more on the chocolate later, we’ve got the savoury stuff to deal with first, which just so happened to be divinely delicious. I’ll be honest, today I didn’t really want to do a lot of experimenting as snowy days call for comfort and warmth, so I turned to one of my all time favourite cookbooks that I know I can rely on time after time. 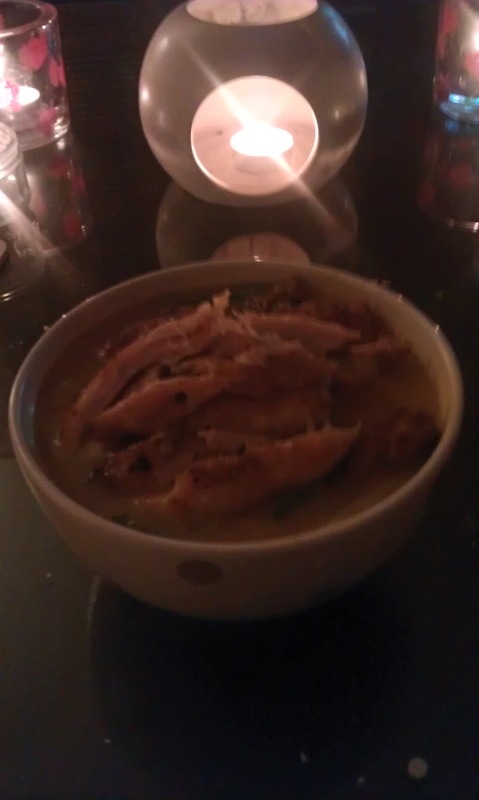 If you assumed Nigella then you would be wrong, for it was Gizzi Erskines’ beautiful book Kitchen Magic that provided me with the recipe for a bowlful of satay chicken noodle soup. I’d not made it before, but this book has given me plenty of tasty Asian meals before and I knew Gizzi wouldn’t let me down. It was perfect. Crispy chicken thighs, spicy Thai tasting broth and slippery rice noodles, what could be better on a day like today? It also took barely any time whatsoever to cook, which is no bad thing when everything smells so good whilst cooking that you just want to scarf it all down in one go. The chicken thighs are coated in spices and despite the fact that I de-skinned them (I know, I know, but I couldn’t justify chicken skin and chocolate now could I? I’m trying to lose weight!) 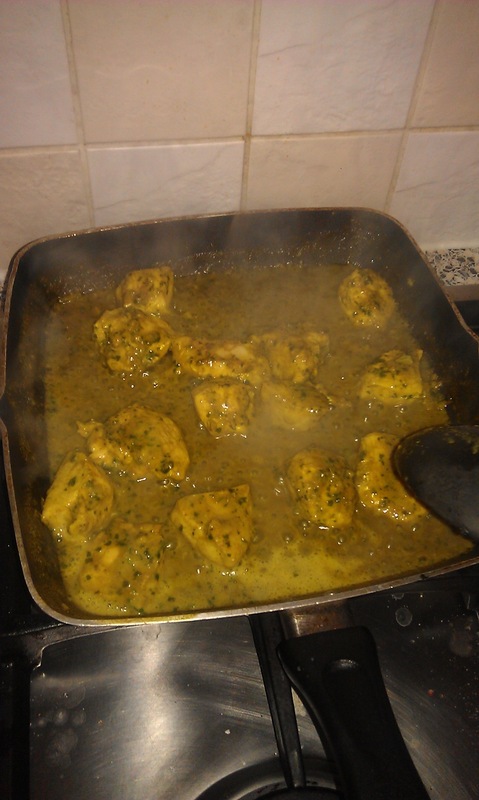 they still ended up being crispy on top and moist within as thighs are fairly hard to overcook unlike the breast. The soup itself contained yellow curry paste, peanut butter, coconut milk and chilli oil amongst other Asian ingredients (store cupboard being put to its full potential) and was exactly what I needed to fight off the winter chill – warming, spicy and full of the complex Thai flavours that make me want to book a flight to Bangkok. If we didn’t have to pay for plasterers, paint and roof tiles I’m pretty sure that’s exactly what I’d be doing right now. Damn you house! Topped with my absolute favourites, mint, coriander and red chilli, it was a blinder of a soup. I’d been very tempted to get a chow mein after walking past the Chinese on the way back from the shop but I am so pleased I resisted and went for this instead, it really is very very good and much better for me than an MSG laden takeaway. 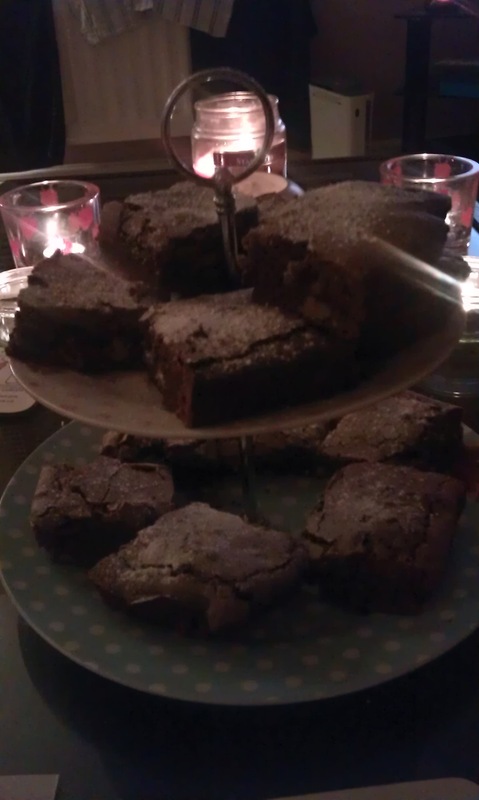 Following on from the soup I made chocolate, cherry and walnut brownies from In The Mood For Food by Jo Pratt. This is definitely my most used cookbook, although it had its heyday if you will when I first got into cooking and cookbooks several years ago, and hasn’t been used as much recently. This is a shame as just like Nigella and Gizzi, you can rely on Jo to give you quality food that tastes gorgeous with minimal effort. I think it’s a woman thing, male chefs like Jamie and Gordon want to wow you and cook food under pressure or impossible time limits, whereas women just want to feed you without all the palaver. It’s not about showing off, it’s about delivering tasty food that doesn’t stress you out when cooking it. Yet again my trusty store cupboard came into play, providing me with glacé cherries, walnuts and the usual baking ingredients. All I needed from the shop was chocolate and butter (just hearing those two words together makes me salivate). The best part about baking brownies though is easily the licking of the bowl afterwards once the brownie mixture that actually made it to the oven is cooking away. 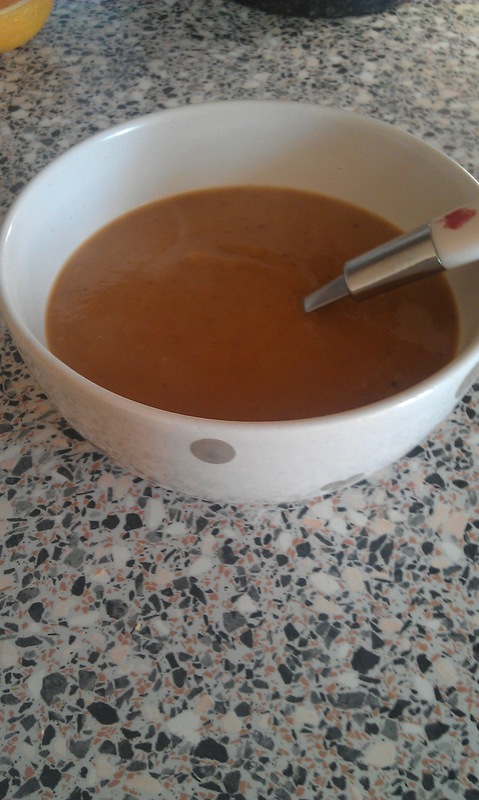 I have just two rules regarding licking the bowl and they are as follows: 1) always use a teaspoon, never a tablespoon. A teaspoon means it takes longer to clear the bowl out and tricks your mind into thinking you’ve had more as you have to keep going back for more. 2 licks of a tablespoon compared to 4 in a teaspoon, it’s a no brainer, and 2) if someone is in the house with you, only tell them that its bowl licking time (and no, that really isn’t a euphemism) once you yourself have had a few teaspoons of it yourself. You cooked that bad boy brownie, you reap the rewards and don’t let anyone tell you different. If The Boyfriend tries to get in there with his teaspoon before I’ve had my fill, it’s like a scene from a wildlife programme where the lions are fighting over a zebra carcass. Love means never having to share your brownie mix. Now I’ve never had a bad brownie, they are pretty hard to mess up as all the ingredients are very tasty on their own, let alone combined, and this brownie was no exception. Crunchy walnuts, sweet and sticky cherries combined with dark chocolate, perfect. The brownies are squidgy in the middle with a crisp top and the tiny amount of sea salt added cuts through the intense sweetness of the gooey brownie. I did try to be inventive and added a capful of Baileys to use up the leftover dregs from Christmas, but there was not even the slightest trace of this in the taste and to be honest when the chocolate tastes as good as it does in this brownie who even cares? Keeping on theme, I dusted them with a blizzard of icing sugar for extra presentational effect. I’ve got to trek over to the house tomorrow in these snowy conditions and I’ll be bringing a tin of these brownies with me, chiefly as fuel for our mate doing the electrics, but also as emergency rations if my car gets stuck for hours on the road. I may not have a shovel, torch or spare jumpers in my boot, but at least I’ll have sugary, chocolatey goodness and really, isn’t that what everyone should have to hand in an emergency situation? Jamie Oliver has got a lot of explaining to do. Not content with lying to the public about how long it takes to cook delicious meals that consist of several dishes or courses, he’s now decided to fib about how easy it is to make homemade Scotch eggs. Outrageous! What on earth will he be lying about next?! I know everyone lies, it’s unavoidable and I may have told a white lie or two in the past (usually when The Boyfriend asks me what’s in a dish- “No, there is absolutely, positively no lemongrass/rosemary/sweet potato in there whatsoever, your tastebuds are deceiving you, you poor thing”) but when your job is writing cookbooks that people rely on to cook their family dinners, lying is a big problem. That’s why I love Nigella, she’s upfront about what the recipe will need you to do and she tries to simplify things where possible. But Oliver is a different kettle of fish entirely. 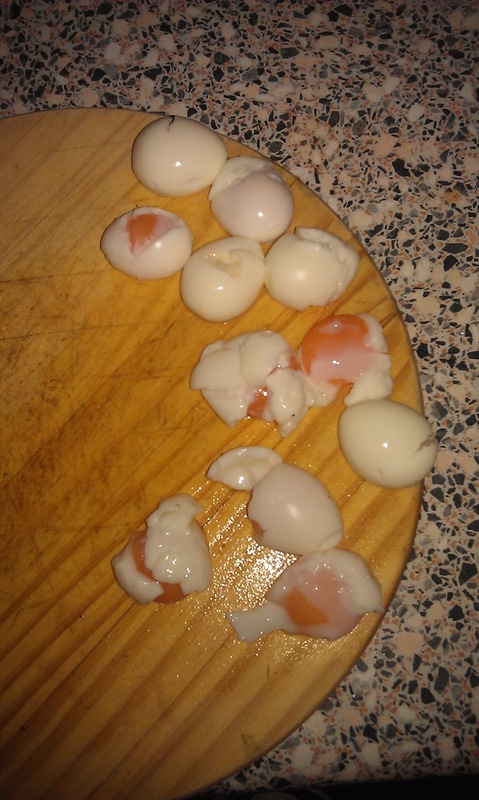 It might seem that I’m overreacting but when you’ve been reliably informed that half boiled quails eggs are easy to peel and then find yourself screaming with frustration when yet another egg splits and leaks yolk all over your fingers, you start to hold a grudge. I wanted to make the Wee Scotch Eggs from his Great Britain cookbook, which has in the past been fairly reliable, for The Boyfriends last night in England before jetting of to Beijing for 2 weeks. He does not enjoy eating out in Beijing and laments the fact that out there he can’t seem to find a good duck chow mein or roast pork curry. I know, my heart bleeds too. As foodie as I can be, I do agree that a Chinese takeaway from England beats the authentic food I’m told he has eaten out there. I’m all for authenticity but I’m too fond of a takeaway to think otherwise, and having no real urge to go to China I will probably never know for sure. Suits me. Keeping in mind the fact that he’ll probably be living off plain rice and minibar nuts for 2 weeks I thought it would be nice to cook him something distinctly British for dinner, and everyone loves Scotch eggs, right? Well, I used to but if I ever see another one I may start twitching and showing signs of post traumatic stress. The ones I cooked last night were mini versions that Jamie promised would be easy, even going so far as to say that making 30 eggs takes barely anymore time than the 12 stated in the recipe. Well as I nearly had a mental breakdown by egg six, I’d hate to see what state anyone who attempted more than 12 would be in. After boiling the quails eggs for two minutes I started to peel the shell off the tiny eggs, which Jamie said I would get the hang of after a couple of goes. ‘OK’, I thought after peeling off the entire top half of two eggs, ‘this is fine, after all I bought more eggs than we needed in case something like this happened.’ Now I am not a very dexterous person and I normally avoid doing anything too fiddly in the kitchen, but I really, really, really made an effort to be careful with them and pretty much all of them split or were damaged in some way. Coating the ones that weren’t too monstrous in sausage meat, flour, egg and breadcrumbs, I took my first ever plunge into deep fat frying and let them sizzle away for four minutes until cooked. Once again, I followed the instructions to the letter which is very unlike me, so was expecting a Scotch egg with an oozy yellow yolk when bitten into. Jamie’s lies struck again. They were all hard bloody boiled in the middle, which came as a bitter disappointment to The Boyfriend who is a big fan of a runny yolk. Considering how long it took to make and how it nearly cost me my sanity (which at times is hanging by a thread anyway), it did not taste nearly good enough to justify the time spent on them. Plus I have a saucepan half filled with vegetable oil and breadcrumbs that I don’t know how to dispose of properly. 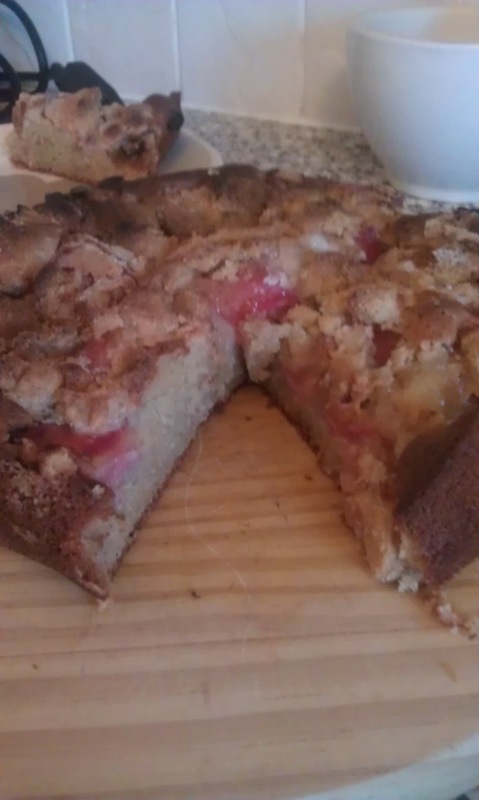 Thank you very much Jamie Oliver. 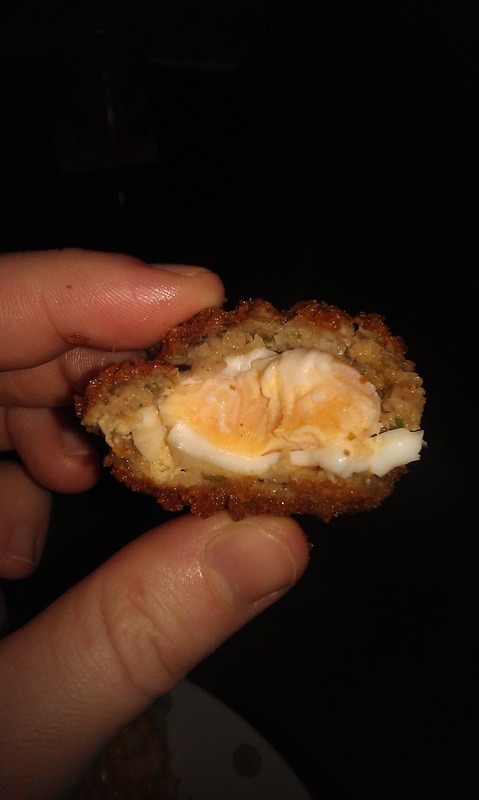 If ever I go to Jamie’s Italian or Fifteen I’m going to have to keep a quails egg ready in my pocket should he happen to turn up doing the rounds, so I can throw it at him whilst shouting “peel that, motherf****r”. It’s war Jamie. My advice if you have this book is simply to go to a nice deli and pick up a decent handmade Scotch egg from there instead. There’s a very good reason why they sell them. Approach this recipe with caution, and please note the photo of my massacred eggs before I hid their injuries under a layer of meat. After eating his Scotch eggs, The Boyfriend turned to me and said “that sausage meat tasted a bit herby, did you add anything to it?” To which I replied “Of course not darling, I’d never dream of adding paprika and finely chopped rosemary to the meat”. I think I got away with it.